Kyrenia, our sun-drenched hideaway on this holiday to Cyprus, offers an enchanting taste of life on Cyprus’ northern coast. Take a seat at one of the cafe tables that line the edge of its pretty horseshoe harbour to watch the boats and gentle movement of the blue waters. Wander through the charming narrow lanes, visit the 16th-century castle that still guards the harbour, or head along the coastline or up into the Pentadaktylos mountains to explore. Flights also available from airports in England – Belfast, Birmingham, Bristol, East Midlands, Leeds Bradford, Liverpool, Gatwick, Heathrow, Stansted, Manchester & Newcastle – click here for more information on dates & prices. 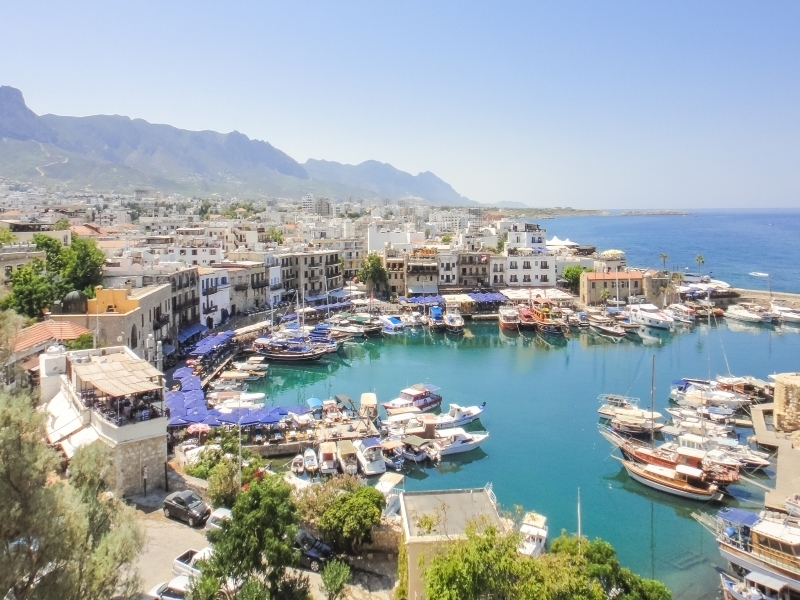 The delightful port of Kyrenia, sits in a natural horseshoe-shaped harbour beside pristine azure waters. The harbourside shops, cafes and restaurants are still watched over by the imposing castle, that has guarded the port since the 16th Century. Within the massive castle walls you’ll find a fascinating shipwreck museum, and a gallery of archaeological finds from the surrounding area. After your tour you’ll be free to return to your hotel by coach, explore the town or take a seat in one of the harbour’s delightful cafes or fish restaurants. From Salamis you’ll head to Famagusta. Here ruined churches, the Lala Mustapha Pasha mosque (once the city cathedral) and Venetian Palace rise in amongst the city’s modern cafes and shops, and the Varosha quarter remains a ghost town since it was abandoned in 1974. In the northern territory, Lefkosa, you’ll see the 15th-century Buyuk Han, once the largest caravanserai (roadside inn) on Cyprus and now a popular arts centre, the colourful covered bazaar and the cathedral/mosque of Selimiye/St Sophia. After crossing into the southern territory, Lefkosia, you’ll have free time to explore the narrow streets that shelter within the Venetian walls of the old town. Why not visit tiny St John’s Cathedral or one of the various museums of Cypriot history and culture before we return to Kyrenia. Enjoy the hotel and its surroundings, head into Kyrenia once again, or join our optional excursion to the citrus-grove surrounded town of Guzelyurt. The town’s name means “beautiful place” in Turkish, and you’ll have time to see its archaeology museum and church of Agios Mamas before we continue to the Roman and Byzantine ruins at Soli, and the Green Line border town of Lefke. The magnificent mountain-top castle of St Hilarion, which boasts spectacular views of the coastline and surrounding mountains, is your first stop, today. In the foothills below lies the idyllic village of Bellapais and the ruins of Bellapais Abbey. Celebrated novelist Lawrence Durrell lived here for three years, and recorded his stay in his novel ‘Bitter Lemons’. After time to explore, you’ll return to Kyrenia. Our final excursion takes us into the Karpaz (Karpasia) peninsula. This a rugged spit of land surrounded by blue waters is home to ancient villages and herds of wild donkeys, and boasts some of the island’s most stunning beaches. Visit an ancient olive press, and see the intricate mosaics at Agios Trias, and perhaps stop for a swim at a beautiful beach (weather permitting). You’ll return to Kyrenia to enjoy your final dinner at your hotel.